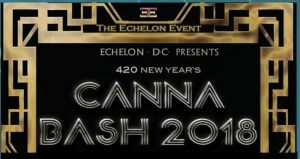 Bring in 2018 with Echelon DC Events at an underground secret location! Experience vaporlicious aromas and infused delights that are guaranteed to give you a magical night to remember! In accordance with Initiative 71 there are no marijuana products for sale or associated with the price of any ticket for entry or VIP access.